The start of the Superbike race at this year's Ulster Grand Prix at Dundrod. The organisers of the Ulster Grand Prix have confirmed the dates for the international road race in 2019. Practice for the Dundrod showpiece will get underway on Wednesday, August 7, with the first four races taking place on the Thursday of Bike Week after final qualifying. These include the Superbike, Supersport, Ultra Lightweight/Lightweight and Supertwins classes. 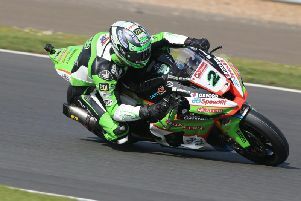 Peter Hickman won two races this year in the Supersport and Superbike classes. Seven races will run on the main race programme on Saturday, August 10. The number of newcomers next year will again be restricted and the Superbike, Superstock, and Supersport classes will only be open to international licence holders. National licence holders are eligible to compete in the other classes. Clerk of the Course, Noel Johnston, said: “My key message for everyone, but specifically newcomers, is that Dundrod is an extremely fast and technical circuit which must be treated with respect, and that means doing a serious amount of groundwork before taking your place on the grid. “With that said, we are looking forward to welcoming the tens of thousands of motorcycling fans from across the globe, that will descend on Dundrod for the 2019 UGP Race Week,” Johnston added.